While keeping true to the work truck mission, Ram Chassis Cab designers worked closely with engineering to give Ram's line of halo-capability trucks an optional level of comfort with the new Limited model for those customers who have an enthusiast's passion and want a fitting truck to handle the weight. While keeping true to the work truck mission, Ram Chassis Cab designers worked closely with engineering to give Ram's line of halo-capability trucks an optional level of comfort with the new Limited model for those customers who have an enthusiast's passion and want a fitting truck to handle the weight. The 2019 Ram Chassis Cab also offers a 12-inch reconfigurable touchscreen display with SiriusXM with 360L. Adding to its leadership in technology, the new Ram Chassis Cab is the only truck in the segment to offer adaptive cruise control, Forward Collision Warning, Automatic Emergency Braking (AEB) and AEB with trailer brakes on all trim levels, according to the manufacturer. "Ram Chassis Cab operators work their trucks at maximum capability in the harshest drive cycles every day. By offering 35,220 pounds of towing capacity, 12,510 pounds of payload and a Gross Combined Weight Rating of 43,000 pounds, our 2019 Ram Chassis Cabs take segment leadership in areas most important to customers and upfitters alike," said Reid Bigland, Head of Ram Brand, FCA. "With the Chassis Cab Limited, we've also created something the segment has never seen, surrounding owners in premium materials and technology with the highest quality interiors, active safety systems, and of course, our award-winning Uconnect technology." The standard engine in the 2019 Ram 3500/4500/5500 Chassis Cab is the proven and potent 6.4-litre HEMI V-8 with up to 410 horsepower and 429 lb.-ft. of torque. The Ram 3500 Chassis Cab now employs exclusive Fuel Saver Technology cylinder deactivation to increase fuel economy. When the engine is paired with the optional Aisin AS66RC six-speed automatic transmission with Power Take-Off (PTO), Fuel Saver Technology functions under light load while in stationary PTO mode to reduce fuel consumption. In the Ram 4500 and 5500 Chassis Cab, the 6.4-litre HEMI V-8, paired with the Aisin AS66RC electronically controlled 6-speed automatic transmission with optional Power Take-Off (PTO) capability, delivers 370 horsepower and 429 lb.-ft. of torque. In all Ram 3500/4500/5500 Chassis Cab applications, the 6.4-litre HEMI V-8 uses interactive Deceleration Fuel Shut-Off, which stops fuel flow to the cylinders when decelerating, to improve fuel economy. A significantly revised Cummins 6.7-litre inline-six turbo diesel is optional on the 2019 Ram 3500/4500/5500 Chassis Cab. Paired with the Aisin AS69RC electronically controlled six-speed automatic transmission with optional PTO capability, the Cummins engine delivers 360 horsepower and the highest available torque in Class 4 and 5 at 800 lb.-ft. The 2019 Ram 3500/4500/5500 Chassis Cab offers customers a trio of automatic transmissions. The efficient, smooth-shifting TorqueFlite 8HP75 eight-speed automatic is the standard transmission with the 6.4-litre HEMI V-8 in the 2019 Ram 3500 Chassis Cab. It's also the first time an eight-speed transmission is offered in the segment. The electronically controlled Aisin AS66RC six-speed automatic is the standard transmission for 2019 Ram 4500/5500 Chassis Cabs equipped with the 6.4-litre HEMI V-8, and optional on the Ram 3500 Chassis Cab with the 6.4-litre HEMI V-8. This transmission offers the option of PTO capability on the left or right side. New 2019 Ram 3500/4500/5500 Chassis Cab trucks equipped with the Cummins 6.7-litre Turbo Diesel use an Aisin AS69RC six-speed automatic transmission also featuring PTO capability on the left or right side in 4x2 configurations. Ram Chassis Cab trucks come in four industry-standard frame lengths measured in inches from the cab to the rear axle (CA): CA 60, CA 84, CA 108 and CA 120. Frame rail width also follows industry guidelines at 34-inch spacing. A reimagined center console is a functional workspace with more than 12 different storage combinations. Up from 23 to 39 liters, the console includes a wider docking area with optional wireless charging, which can hold a small tablet or smartphone. To keep devices charged, five USB ports assist in the center console - three up front and two in back, four of which are paired with type-C ports for faster communication and charging. Two available 115-volt three-prong plugs can handle up to 400 watts for charging electronic devices or power tools. Folding up the rear bench seat reveals additional contained storage space with under-seat compartments. For 2019 the Ram Chassis Cab shares exterior sheet metal with Ram Heavy Duty, including a massive new R-A-M grille, which not only provides an in-your-face statement but also flows a high volume of air to cool the 6.4-litre HEMI V-8 and the Cummins 6.7-litre Turbo Diesel engines. Interlocked with the new, lighter aluminum hood, the larger and more aggressive front clip leads with confidence and strength. All navigation, Wi-Fi, radio and SiriusXM 360L tasks are handled by a new shark fin antenna - making the new 2019 Ram Chassis Cab the first-in-segment without a mast antenna. The new antenna reduces wind noise, improves signal reception and simplifies select upfits. The new 2019 Ram Chassis Cab is the only truck in the segment to offer an array of active AND passive systems to assist the driver and passengers. 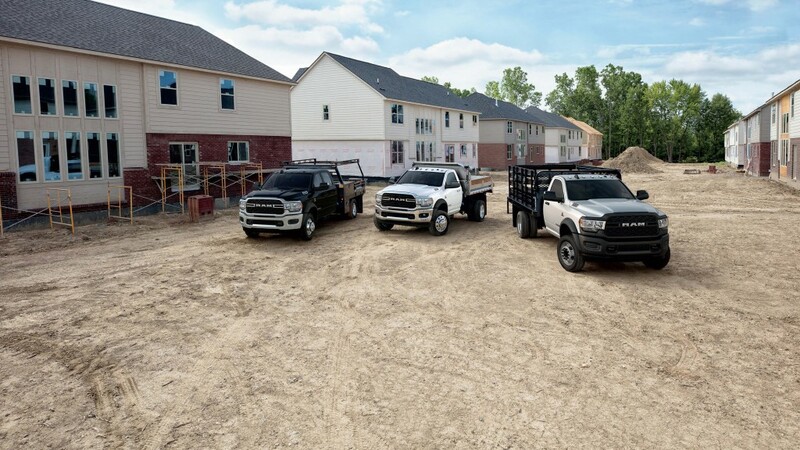 Four trim levels are offered on the 2019 Ram Chassis Cab: Tradesman, SLT, Laramie and the new Limited. Sharing exterior design elements with the 2019 Ram Heavy Duty, the new 2019 Ram Chassis Cab drives the full force of capability with unexpected technology.